Caeland Garner is currently competing on The Voice's fifteenth season, and now he's opening up about significant moments in his life that have led him to this point. 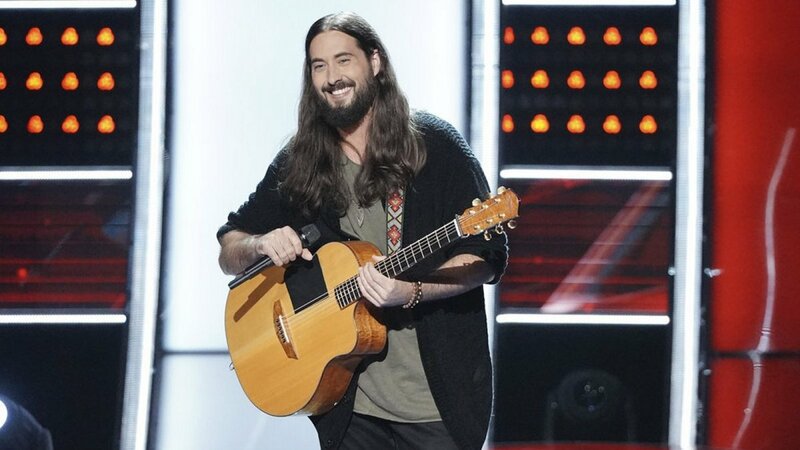 The 31-year-old from Coleridge, NC, who performs background vocals for former The Voice contestant Red Marlow, took the stage with "Dancing In the Moonlight," and both Blake Shelton and Jennifer Hudson turned their chairs around for him. Blake said he wanted to buy Caeland's version of that song for his playlist and his voice is so cool and "unique." Blake was "mesmerized" by his sound and the way he works runs into the song. After Blake noted he'd be "honored" to work as his coach, Jennifer said she's a fan of his voice as well because it's a beautiful instrument. However, Caeland ended up joining "Team Blake." Shortly after Caeland's audition aired, he talked to Reality TV World about his inspiration behind choosing to audition for The Voice. Below is what he had to say. Reality TV World: How much of an impact did Red Marlow have in your decision to audition for The Voice? Did Red tell you anything about his own experience on the show that made you think you'd like to give it a try? Caeland Garner: Oh shoot, yes. Man, Red's a brother of mine. And when he was actually out on the show we had several friends that have been on the show and done well. And we were texting just the whole time back and forth. So I knew what a great experience it was for him to be out there, and I remember the day I called him. I was, like, "Man I have a chance to go out to L.A. to audition for the TV show The Voice." And he said, "Stop right there. Caeland Garner if you don't do this, we ain't friends no more." So I was, like, "Alright, there you go." And I was ready to do it. And then talking on the show, I asked him, I was, like, "You know, this guy's been a huge influence of mine not only as a person because he's a good man, but as a singer." Because in the early years, I didn't know a lot of people in this town and I knew how hard it was as a songwriter and he was introducing me to the biggest writers that I could possibly get in the room with. And on top of that, Red -- a lot of people don't know it -- but he was here for 13 years as a demo singer and was one of the biggest demo singers in Nashville. Almost half the songs I was listening to in the 2000s that were on the radio he was the one actually singing the songs in the studio for the songwriters for them to pitch to the artist. So he was teaching me constantly, how to perfect my voice and how to get in the studio and listening to the artist that I was going to do backgrounds for because I was singing backgrounds for him. So he was just a huge part of my whole journey. I would reach out to him and still, like, man I just need some advice on, you know, like, how to navigate through this world of the show. And he's always been there for me and he was a huge influence on me doing this. He really kind of put my heart at ease to know that this was the right step for my life. Reality TV World: Is Blake the coach you wanted going into your Blind Audition? Is it safe to say there was a very little chance of you choosing Jennifer as your coach, or were you actually considering it? Caeland Garner: Well no, it's crazy because -- so I grew up singing a lot of different music. I love Brian McKnight, Otis Redding and Sam Cooke. And I just sing, a lot of Boys II Men and a lot of oldies music growing up. So I had a huge kind of soul R&B influence. And when Jennifer turned at the same time Blake did, I remember singing and I remember in the moment going, "Oh crap. Like, I might just pick Jennifer right now." But I mean, you know, being here in Nashville, I've never met Blake, but he's always been kind of an inspiration to me musically. He's got the career that I have been striving for and sacrificed everything in my life to get. And so, it was kind of, like, "Alright, God, you know what? I'm not going to take a chance at this. I'm going to go to Blake Shelton because he's going to be the one that can teach me something." And I just told my heart that, so I had to go with Blake. I mean, at the end of the day, I couldn't look at Red in the next room and go -- if Red's over there and if I choose Jennifer, he's going to be, like, "You big dummy." So I just went with my heart and chose Blake. Also during the conference call with reporters, Caeland talked about the journey that led up to him auditioning for The Voice. How did you get on The Voice? What was the path that led you there? Caeland Garner: I went to Eastern Randolph High School in Ramseur, North Carolina. I played baseball there and I was just always in music. And then I went to college at St. Andrews Presbyterian College in North Carolina, and I played baseball there. I threw javelin and shotput for the track team and was on cross country, and I would drive every weekend pretty much when I wasn't in sports to Nashville to be a studio musician. I grew up playing bluegrass and singing in church. And when I started touring when I was about 13 years old -- I was a touring musician through bluegrass -- and I was playing some southern rock and different things. And I met a guy named Red Marlow through some guys in Nashville I knew. And Red asked me to play in his band. And eventually, when I graduated and went to college, he asked me to move to Nashville. So I packed up an old camper I had and I moved to Nashville and lived there for four years, just struggling to put food on my table and sometimes, I mean honestly, there were times I'd sleep in my truck after I got out of the campground when I didn't have any money because I wasn't able to play music anymore. And I signed my first publishing deal and the journey kind of took off from there as an artist and my songwriting career. And I kind of always tried to follow my heart and be the person my mom and dad raised me to be. I just thought I've always wanted to be kind of a light for where I grew up, because I always knew the people that didn't have a whole lot. And I just kind of wanted to chase my dreams to show people back home that dreams are worth chasing. And if you work hard enough you can catch them, you know? Did you actually audition for The Voice before you were granted a chance to perform for the four coaches? Caeland Garner: Yes ma'am I did. One of my friends, Barrett Baber, he was on a couple seasons back. He actually came to my show one night and told me. He was, like, "Man you need to think about The Voice." And at the time, I was really hoping hard, you know, I was praying about a way that I could grow my following. And so, I got in touch with some people on the show and auditioned and it led me to the Blind Audition and that's kind of how it happened. Your father influenced you to play music, right? Caeland Garner: Yes ma'am. So it's kind of 50-50 in a strange way of whom I would say -- why I became the artist I am. So my father grew up as a songwriter and a musician. My dad can play every single instrument, and he doesn't even know he's a genius but he is. He always just picks stuff up and starts playing it. And he would listen to the radio and he could tell me exactly what a guitar player was and hum it back to me and never forgot the melodies. So at a very young age -- I think I was five years old -- my mom put a piano in front of me because her mother played piano in church. So I started playing piano for, like, seven years. And I played four years of organ lessons. And that's the only lessons I've ever taken. And then my dad, when I was old enough to hold a guitar, he put one in my hands and he was like, "Here." I was, like, "Okay can you show me stuff." And he showed me three chords. And then he told me after that, he was, like, "I'm not going to teach you anything else because if you love it you'll chase it yourself." So I grew up and kind of picked on and I didn't have a whole lot of friends, mostly because I was just a weird kid. I would go home and practice for six and seven hours a day, just sit in my room. I would sit down with a CD player and my momma had an old record player, and I would pick up whatever instrument was laying around -- Dobro, mandolin, guitar or the piano -- and I would learn every single instrument on whatever song I was listening to at the time. So my dad influenced me because he put me in the bluegrass world. I was doing that and I was singing country music and I was doing southern rock because he loved that. And then my momma, she was always listening to the Eagles and she was listening to, you know, the Beatles and Sam Cooke and Otis Redding and Brian McKnight and Boys II Men. She was throwing all this oldies music at me. So I always had that to listen to. And I remember, I was never really accepted growing up vocally as a lead singer because I was playing bluegrass music and I wanted to sing soul music. So I always had, like, a very unique individuality in my voice. And I just kind of kept going with that. I guess that's how I became who I am as an artist. A lot of the famous musicians like Elvis, Michael Jackson, the Beatles, many of them never learned to read music. Do you know how to read music and do you have any kind of opinion in general about reading music and being a working musician or pop star? Caeland Garner: You probably aren't ready for the answer. As a kid, my mother went through a rough pregnancy with me, and when I was born they actually told that I wasn't going to make it. And then later, they said I was going to be a vegetable. And I had a lot of developmental issues -- talking and learning to focus. I've got really bad dyslexia. The reason I tell you that is because so early on, they discovered that I had a knack for music. And they put me into piano lessons. So going through piano, I was taught how to read music. And I can read music. But I can't read it quick enough to play. That's my problem. I get caught up and it's just, it's overload for my brain. So my dad always learned how to play by ear, so that's what I started doing. I can hear a melody and I can pick up an instrument and I can play it now. And so, as a producer -- because I have a couple projects I've put out here in town -- I've had some label interest over the years that pushed me to go to The Voice so I can grow my following. So as a producer, I just started learning and looking up some of my heroes that were producers and learning how to hear it and kind of go that direction with it as far as playing. And I utilize the national number system. The national number system is something that happened in the studio, where there's a number associated with every chord. And if you need to transpose the song to a different key, then the numbers still apply to whatever key you're in. So I use that a lot for doing my music if that helps out at all. I think it's the norm for musicians to just play by ear because to me, you know, at the end of the day, I've done it all. Like I've really learned to write. I've learned to read music and try to do things the correct way because I want to become the best artist, musician, songwriter I can possibly be. At the end of the day, I've learned what I'm really trying to practice in my day to day writing I woke up this morning and I had a song writing session. And I remember having the thought, "Caeland keep it simple." At the end of the day, everything I write is for my artist career pretty much. And when I write something, I always try to tell myself the person that I'm singing to is my own. And as an artist, that's who you want to connect with. They don't always want the most complicated thought out musical thing in the world; they just want something that makes them tap their feet and feel good. And, I had a fellow tell me one time, you know, you want to do one thing through music and that's make somebody cry. And whether they cry tears of joy or tears of sadness, it doesn't matter. But if you can do that, you've captivated an audience and you've connected with somebody through a musical sense. So that's kind of what I try to do is just play whatever I feel because if I feel it then it's right. And that's about the only way to do it.